I happened to meet Kiruthiga Udhayanidhi at the Screenwriting Workshop organized by Sri Kamal Haasan. Shortly thereafter she called me to ask whether I would like to be on the cover of her magazine. All that I could say was "I would be honored". After the feature in Hindu MetroPlus this is my second cover story. And I have been super kicked. To be on a magazine cover is a super feeling, for want of a better adjective. I have not read the magazine yet but I requested Mrs Kiruthiga to send me the cover image so that I could put it up on my blog and she sent it to me within seconds. I found her to be highly genteel, extremely down to earth and easy going. Fun to be around. I learnt a new lesson in simplicity and humility from her. Life does present so many opportunities to learn from people if we just care to notice and have a mind open enough to learn. The only person I slightly felt sorry for was Pradeep, the photographer. I could have well been one of his tough subjects. Felt too conscious of the entire lights-camera-pose thing. Shall post an update once I get my hands on the mag. waiting for the mag now!!!! A pic full of poise and elegance. Loved the colors. Shall now try and get the mag! Congrats! U lukin lyk a Rock Star. Lukin fwd fr da Mag. It is nice that I got to know of this new magazine....all credits go to your blog..and not to forget mentioning....you look fabulous on the cover. Cool pic!! You look awesome! Is the article available online?? Adutha adutha level asalta poinde irukeenga paarunga!! Congratulations!!!!... Wishing u be blessed with more success, peace and happiness in life. looks like career change will be good. Wow! Awesome picture! You really look awesome...though you are tough, I'm sure Pradeep would have got what he wanted! Chinmayi! You look GOREGOUS (...as always! )...so classy, elegant, & mature! Thanks for being such a great youth icon & a wonderful role model for the upcoming Indian youth! Keep doing what you do! I wish all the best in the world for you! This is my first comment on your blog. Though i was here for quite a long time and spend some time on your blog everyday, i never felt like leaving comment which goes unnoticed since the entire page would have been already filled by lots of people.. But today i cant leave the page withing my scriblings..
You are really a great inspiration in my life, you proved that girls can do anything and everything.. There is nothing that girls cant do and they are multi talented too!! Girls Rock!! Congratulations!!!!... and ALL THE BEST for ur future projects as well.. Ur talents will definitely make you go places & U DESERVE IT!!!! Like mentioned somewhere in previous comment, u can very well go ahead and start a new career in modelling.. Besides, blog is wonderful, ur pic too!!!!!!! God Bless U..
Hi Chinmayi....I just got to listen to some snippets from the Laya project and would like to congratulate you on this endeavor and would really like to appreciate your effort and the Laya project group as a whole to come up with such a diversified and colorful rendition of the sounds of the sub continent...I sent you a msg on twitter but wasn't sure if you got my msg....oh yeah and BTW the cover pic looks good....keep up the good work....good luck! Looking good Chinmayi. I wonder why you didnt walk the ramp in the show for playback singers on TV the other day. You look really stunning. Super! 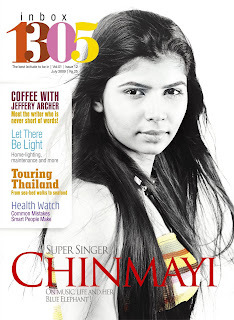 Hi Chinmayi, Is there an online version of this magazine ? Nice pic.. Your looking great and cute. It feels good that you are on the magazine cover.. Great going.. All the best for ur career..
U Rock...Keep Going...Really looking good and Gorgeous. Nice that you feel happy to see yourself on magazine cover. How nice would it be on wikipedia? http://en.wikipedia.org/wiki/Chinmayi lacks a FREE image. Request you to release any picture of you that you own in creative commons license / other free license which you are comfortable with. You can edit wikipedia and add your image yourself, otherwise you can publish it here, i can take that little effort of putting up there. I have no words to express my happiness. You are really great. Am very proud to be your fan. i wish they didnt give that Jothika look to your face... But still the side look works ! Nice ! You look good. I am a fan from England and I remember seeing you on the cover of an arts magazine many years ago. Covers suit you. New avatar! looks gr8.... itz gud... i do sometimes believe that variety is the spice of life and u seem to be of the same panel. BTW... eyes r too daring... "dont nag me i wud kill u" kinda daring! A smile cud 've been much better.... but u pose gr8! dnt knw if u 've a photogenic face. you look very different in every picture, how is that? You look cute n smart in that pic da! Checking after a long time...I guess these are the sort of expressions that would be apt for a magazine cover...good work by pradeep too. Got to listen to 'Laesa'. Eye-Catching picture. Very nice. Keep going with the same spirit. You could have smiled a bit more!!! How to get a copy of this book ?